Squash House Quilts: Teacher's Quilts from Sisters! This is the last post from our trip to Sisters Outdoor Quilt Show. I have so many more photos - I could be at this for a long time! Hopefully I've given you a good assortment of what we saw. 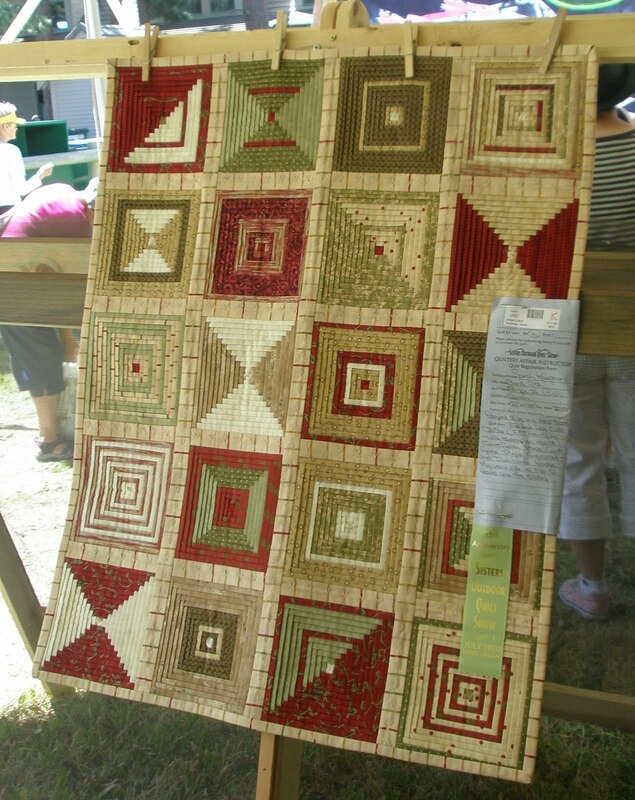 These are photos of many of the teacher's quilts which were displayed in one large tent. It was very crowded inside, so I apologize for not knowing who the quiltmakers all are! I'm sure many of you recognize the first two from Sue Spargo! She is most certainly one of my favorites! The next two are by Sarah Kaufman of Bend. They are called "Folded Log Cabin" quilts. Sarah has a book on this technique which will be released soon - I've already pre-ordered it from Amazon here Check out the bottom of the first one which she's embellished in denim! The two "car quilts" below were amazing! The animals below seemed so real! This quilter has a wonderful sense of humor! Click on the photo to see more detail! Mr. Squash and I really fell for this salmon quilt! I wish I knew the designer of this final quilt - the detail and quilting is extraordinary! Below is a closer look at the looped binding! I lightened the photo up a tad so you could see the detail better. The photo above is more true to color. Now that we're home I have loads and loads of inspiration to keep me going until next year! I think I might spend the rest of today in front of my sewing machine! Many of you have commented that you wished you could have been there! I say let's rent that huge house Mr. Squash and I stayed in next year and all go together! What do you think? thanks for showing us some of the beauties! i love that last one... great details. Wow! Truely art! I am so blown away by quilters who think outside the box and come up with new techniques and ways to do things. Amazing! Those are beautiful. Sue Spargo's magnolia house is definetly one on my to do list. Thanks Candace. Looks like you saved the best for last. Beautiful quilts. SO original. That looped binding is similar to one Sharon Schamber did. What attention to detail! What amazes me is the difference in style and type of quilts. And talents women have! Super amazing. Those quilts are amazing...thanks for showing them. I love the border of the last one. Beautiful quilts, what a fun time. Lovely quilts, Candace. I envy you being able to see the Sisters show. Thanks for the pictures. My goodness, such beautiful quilts for sure, my dear friend. Thank you for sharing. Thanks so much for the virtual quilt show--it's amazing to see them all!